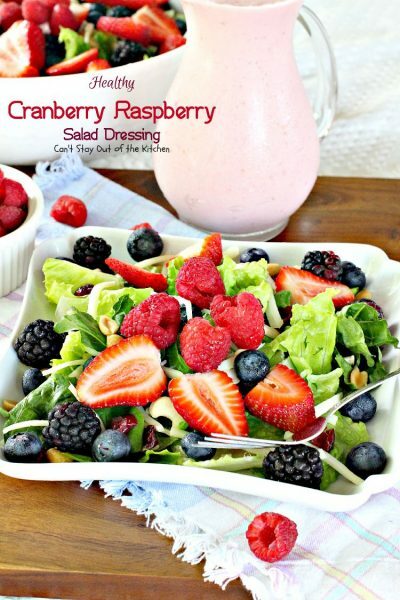 Healthy Cranberry Raspberry Salad Dressing is delightful. This is the second lovely salad dressing I made using Greek yogurt and honey. This time I used a raspberry vinegar and a cranberry juice with blackberries, blueberries, grapes and apples. I wanted to get a cranberry raspberry juice that was 100% juice but couldn’t find any that don’t add sugar or splenda. This turned out really well. Because of the tartness of the berries I added a little extra honey compared to the other two dressings. This dressing is healthy, low calorie, has no sugar, no high fructose corn syrup, no artificial sweeteners, no additives, no MSG, no preservatives, no gluten, and no oil! It’s a very faint pink in color – really more like cream with just a tinge of pinkish color to it. When I initially posted this recipe in October 2012, it was still the early days of my blog and my picture taking abilities were zilch. Since then I’ve upgraded from an iPhone 3 to a Canon and I’ve learned a thing or two about presentation. As a result, I’ve been going back through all my first year blog recipes and remaking them so I can get better pictures of each post. I recently remade this recipe (July 2015) for a family dinner and also changed the recipe up considerably. 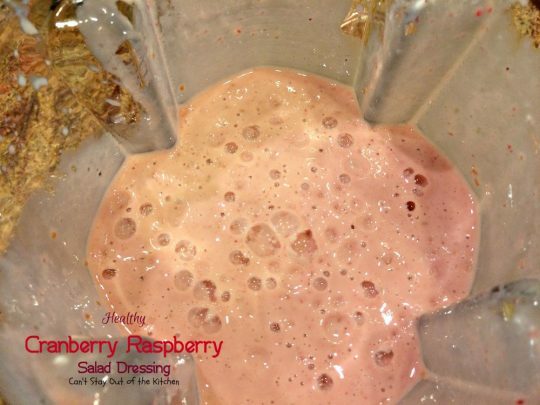 This time when making the dressing I added raspberries to increase the flavor, color and texture. I found this version absolutely delightful. I hope you do to. 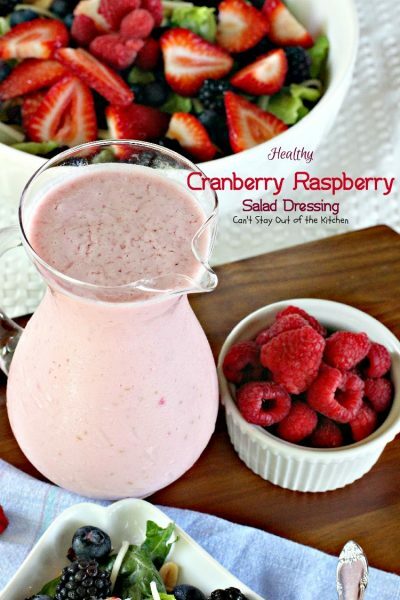 Healthy Cranberry Raspberry Salad Dressing is a great salad dressing for any kind of salad. Here’s a look at the salad! Makes me hungry just looking at it! Healthy Cranberry Raspberry Salad Dressing can be whipped up in just about 5 minutes! 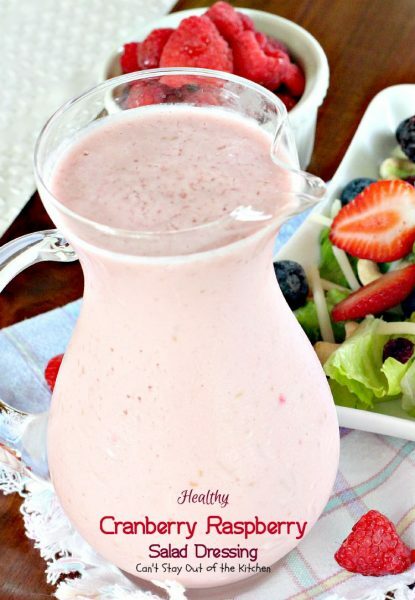 Place Greek yogurt into a blender. Add honey and raspberry wine vinegar. 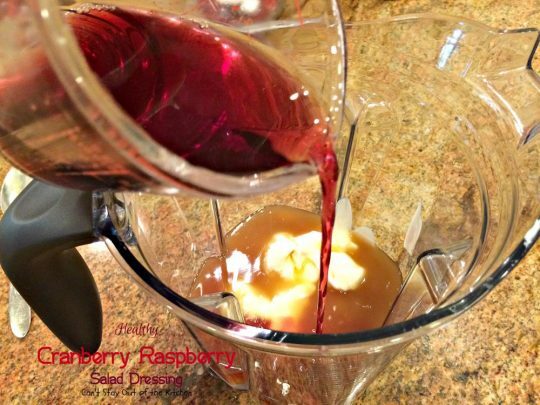 Add cranberry/raspberry juice or other cranberry juice blend. Blend in your blender for about 10 seconds or until well mixed. 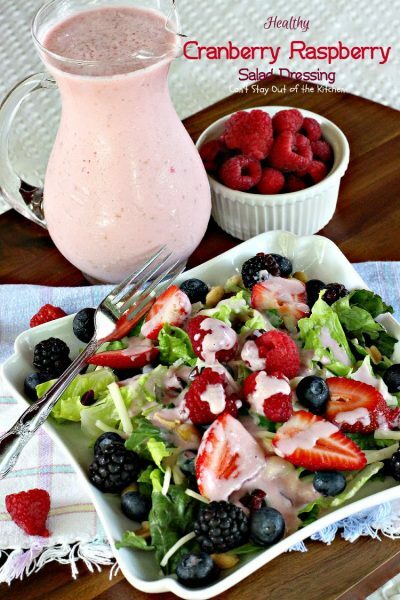 Healthy Cranberry Raspberry Salad Dressing is gluten free. 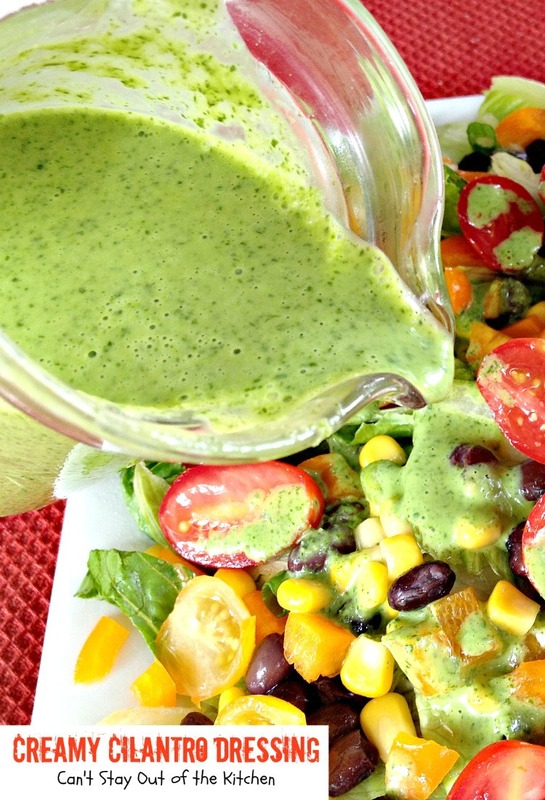 Drizzle salad dressing over your favorite tossed green salad. Healthy Cranberry Raspberry Salad Dressing contains no oil, no sugar, no preservatives, no MSG. Healthy and delicious gluten free salad dressing that's so quickly and easy because it only has five ingredients! No oil, sugar, MSG or high fructose corn syrup. 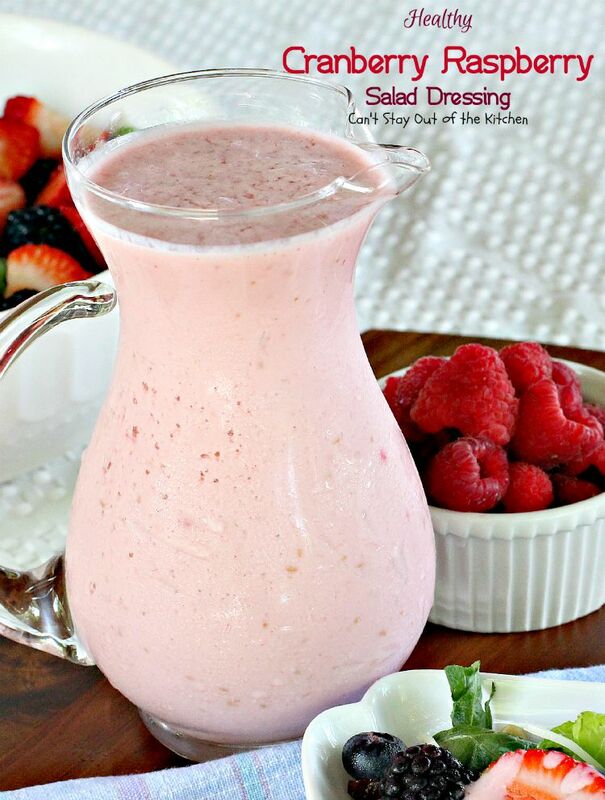 Place all ingredients in a blender and mix about 10-15 seconds until well pureed. 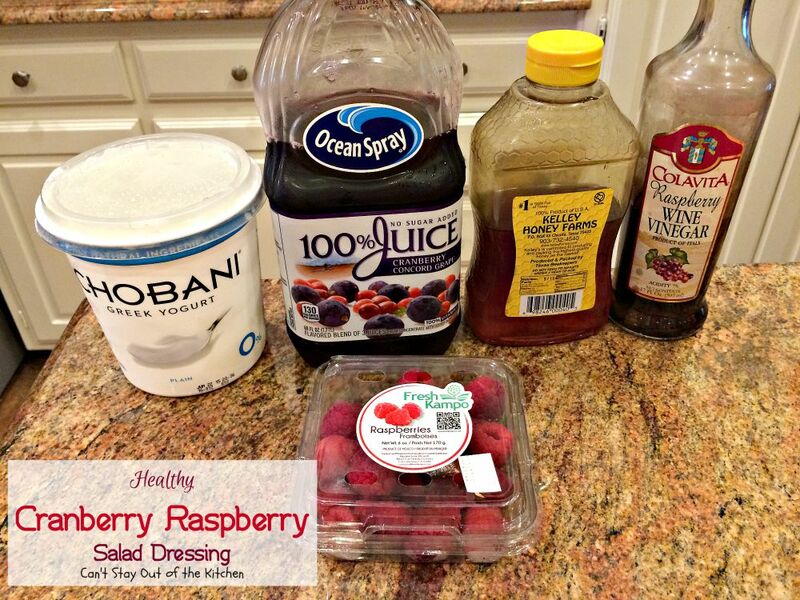 NOTE: I used ¾ cup honey, but if you like a sweeter salad dressing, than increase this to 1 cup. You can also substitute sugar, but start with lower amounts first, since sugar is sweeter than honey. 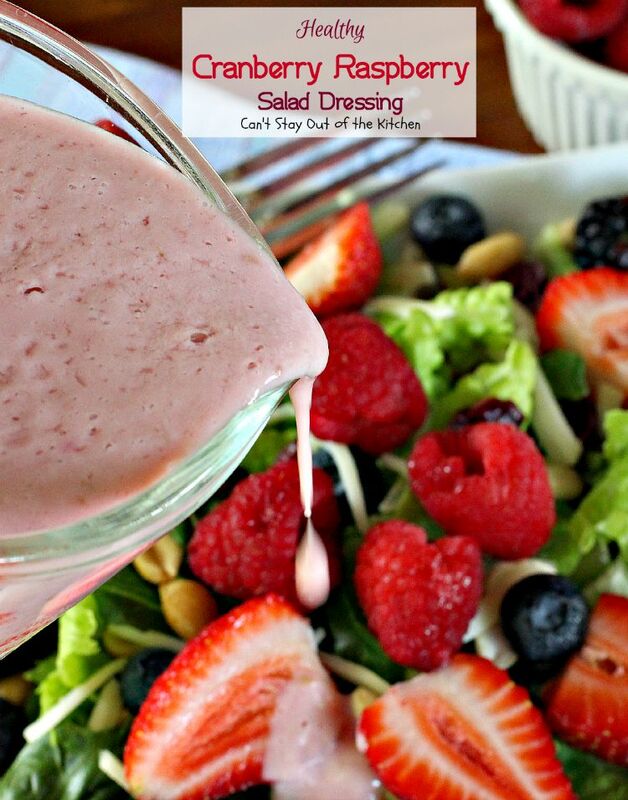 Healthy and delicious gluten free salad dressing that’s so quickly and easy because it only has five ingredients! No oil, sugar, MSG or high fructose corn syrup. 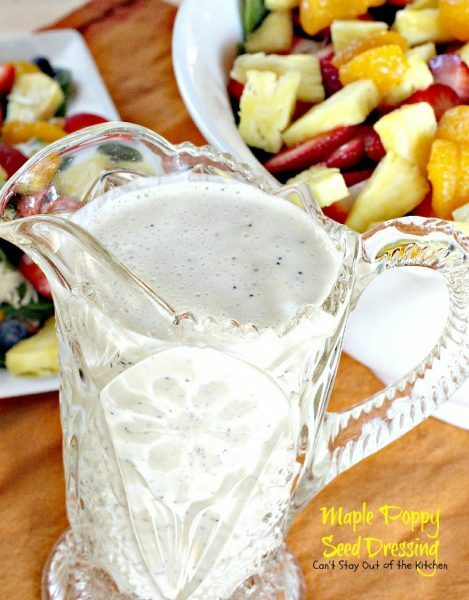 I used ¾ cup honey, but if you like a sweeter salad dressing, than increase this to 1 cup. You can also substitute sugar, but start with lower amounts first, since sugar is sweeter than honey. This really is a delicious, simple and easy dressing to put together with all natural ingredients. This dressing is especially good with tossed salads with fruit. 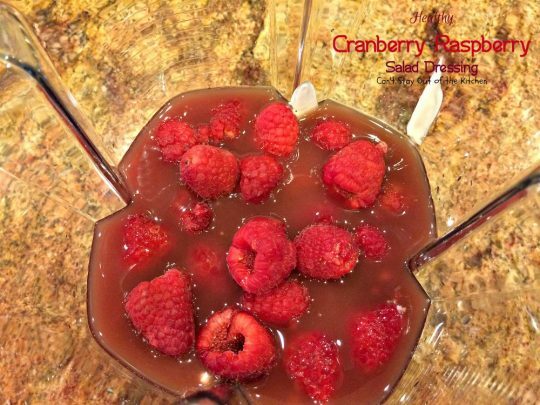 Healthy Cranberry Raspberry Salad Dressing makes a great dip for fruit, too. I’m sorry, I don’t have a calorie count on the recipe. 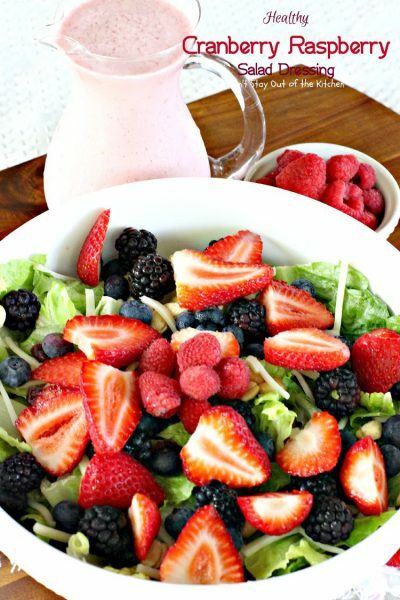 What a great, healthy way to dress a salad. I need to make more dressings. It’s so very easy and tasty. I think it would make a great fruit dip, too. You can always add more Greek yogurt if you want it thicker. 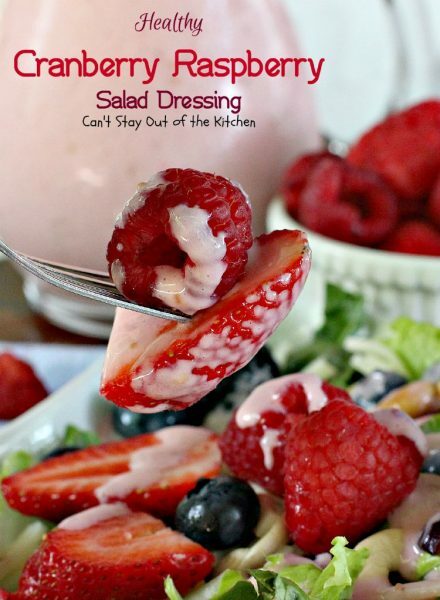 With the holidays coming up that is a good idea for a salad dressing. Thanks for the idea for this dessing. So easy and quick to make, too.